©Healy Racing Photos After his success half an hour earlier on Miss Snossyboots Ronan Whelan doubled his Dundalk score aboard Lyrical Attraction in the Racing Post Handicap. 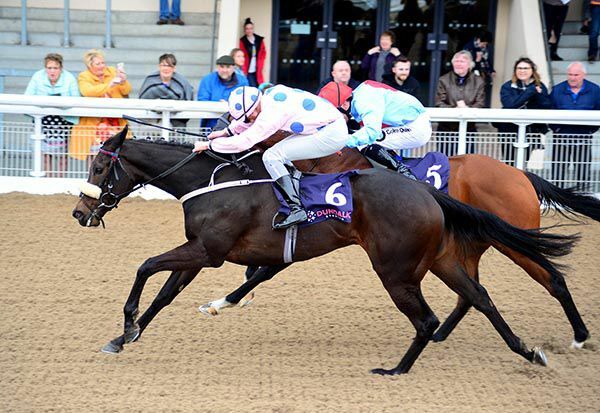 Whelan was successful aboard Miss Snossyboots for Michael Halford and he took the reins on Lyrical Attraction for owner Catherine Harrison and trainer Jarlath Fahey. The Dandy Man filly was towards the rear and pushed along early. She soon made headway on the inner and was fifth at the halfway stage. Pushed along again approaching the straight, Lyrical Attraction was ridden to go second a furlong and a half out, leading a hundred and fifty yards out and keeping on under pressure to score by a neck from Esprit De Lumiere. “It was a hard fought win but at least she had her head in the right place at the right time,” said Fahey. “She's a very easy going, lazy filly and we thought the step up in distance would help her as she was left a bit behind in the mile races. 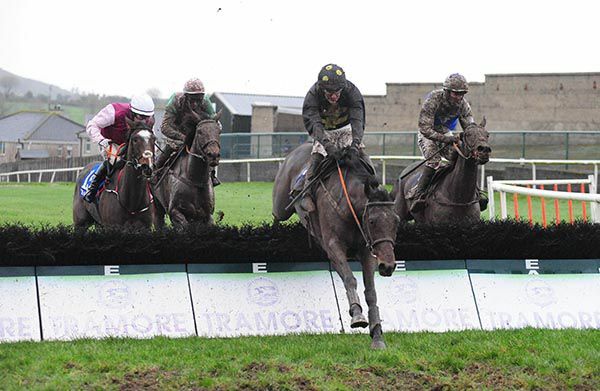 “She travelled a good bit better today but still made Ronan work hard to get her head on the line. “She's home-bred by David and Catherine Harrison who own her so it's great to get a winning bracket for her as they are planning on keeping her as a broodmare. She has a nice pedigree behind her. THE Irish Horseracing Regulatory Board has announced that there is to be an 8am precautionary inspection at Tramore on Monday morning due to a Status Orange weather warning issued by Met Éireann and the risk of heavy rainfall. The ground is currently heavy.